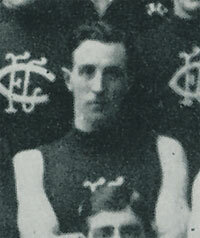 Hore played 15 games for Carlton after debuting in 1915. He had previously played for St Kilda and Melbourne starting in 1913 where he had played 6 games for 1 goal. He was originally recruited through Northcote/Carlton District/Police. Contributors to this page: Bombasheldon , molsey , tmd1 , p(12)terg , WillowBlue , Jarusa and admin . Page last modified on Wednesday 05 of June, 2013 21:04:03 AEST by Bombasheldon. 1989 - Future Blue Peter Green NSW Junior Rep.